If you thought making authentic, delicious Creme Brulee was only for the master chefs, think again. With this Culinary Torch, you can now make restaurant quality desserts at home. Get the tool all the chefs use to create eye-catching entrees and dazzling desserts. This amazing torch perfectly melts cheese, crisps meats, and chars vegetables to achieve ideal textures in every bite! It's the perfect kitchen accessory and essential tool for preparing the classic Creme Brulee, but it also has a variety of other uses in the home kitchen - including browning meringue or melting cheese on soup. 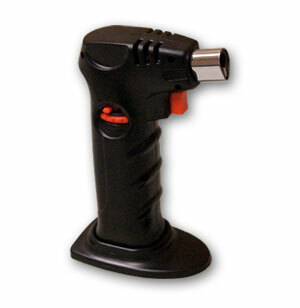 The Culinary Torch makes a great gift or is a creative way to spice up your next dinner party!